Kale is one of the great vegetables that is available fresh over the winter. We are always on the lookout for new ways to prepare this great vegetable. This was a very interesting and tasty use for kale. We really enjoyed the meal. Cook the cornmeal in the vegetable stock with the bay leaf. When the cornmeal has thickened, remove the bay leaf and pour the polenta on a silicone prepared cookie sheet. With a lip smooth the polenta to an even “sheet”. Clean the kale, remove the thick stem and chop fine. Chop the garlic, cut the sun-dried tomatoes and soy cheese in small piece. Heat 1 tablespoon oil, add the kale and cook until wilted. Add the chopped garlic, sun-dried tomatoes and soy cheese. 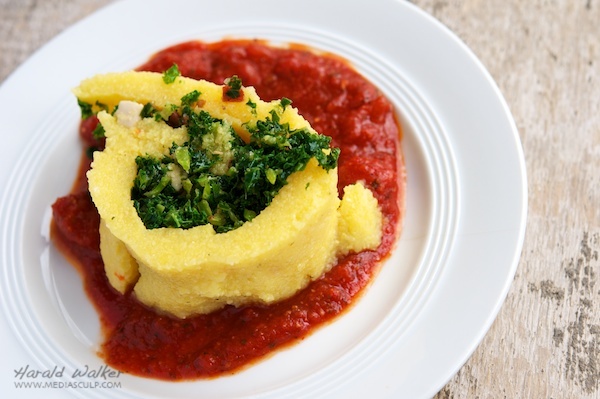 Place the kale mixture along 1/3 of the polenta and roll the polenta while removing it from the silcone mat. 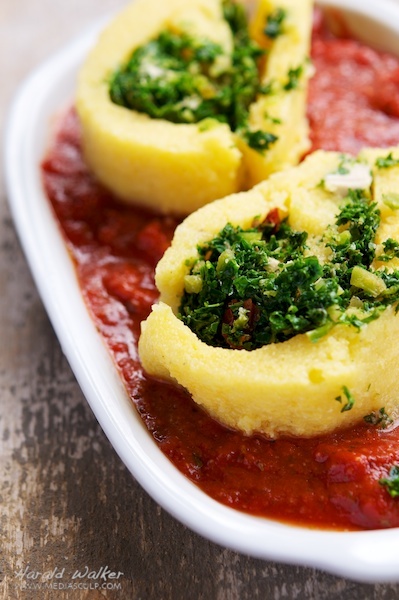 Allow the rolled polenta to rest. Place some of the tomato sauce on a plate, top with one or 2 slices of the roulade. Heat the servings in the oven for 5-8 minutes to re-warm the roulade. I used the coarse cornmeal (polenta) and it was challenging to keep the roulade from breaking. You might consider using 3/4 cup of the coarse cornmeal and 1/4 fine corn flour as in making cornbread. Don’t spread the kale filling too thick and make the roulade while the cornmeal is still slightly warm that way, if it breaks you can push it back together gently and it will become more solid as it cools. Posted by Chris Walker on March 9, 2012 in Kale, Main Dishes, Polenta, Tomato.